American gold coins had been one of the most common means of payment in the emerging financial markets throughout the 19th century. They were much more durable than paper money and were able to survive rough conditions and heavy circulation. High gold content added to their value and attraction making them one of the most essential building blocks of early American Economy. Five dollar gold coins were one of first ones ever produced by the US Government and are currently considered one of the rarest and most desired additions to any numismatic collection. Let’s take a look at five most interesting facts about their history. 1. The history of five dollar gold coins goes back to 1795 when the first American coins were ever minted. The very first 5$ coins were struck with a classic image of Liberty on one side and the American Eagle on the reverse. 2. All five dollar gold coins feature a unique design of cutting various images into the surface of the coins, unlike all other gold dollar coins that showcase bas-relief imaging with its characteristic raised pattern. Surprisingly, the sunken design was not popular at the time due to strong beliefs that indentations could become breeding ground for bacteria and spread illnesses. 3. American five dollar gold coins became incredibly popular due to their high gold content among European entrepreneurs in the 1800’s that enabled them to resell them at a profit in many European countries where silver to gold mintage ratio was slightly lower. This was, however, stopped by the US Government in 1834 by establishing a new coin weight standard that made this “buy to melt” practice no longer profitable. 4. American President Roosevelt gave start to a new five dollar gold coins image design that was carried out by a sculptor Bella Lyon Pratt in 1904. The new $5 coin featured a profile of an Indian Chief and is referred today as “Indian Head”. 5. The mintage of $5 coins was stopped in 1929. Most of these were damaged by heavy circulation or melted down during Great Depression historical period. $20 gold coins represent another gold coin denomination that became incredibly popular similarly to its $5 variations during California Gold Rush era. Twenty dollar gold coins were being minted starting from 1866 and ending around 1907. 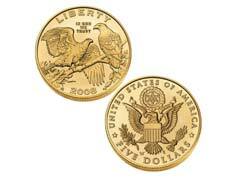 If you are an avid collector, American eagle gold proof coins could become a great addition to not only your gold coin collection but to a recession proof investment. These coins are collector version of historical American Eagle gold coins that come in four sizes and in limited quantities.